Authorization to build Duluth’s first streetcar line—which by grant had to consist of at least one-mile of track with rides on cars of “the best quality” costing no more than a ten-cent toll—was granted in October 1870, but no one rode on a Duluth streetcar until 1883. The Duluth Street Railway Company incorporated in 1881 and work began on tracks along Superior Street from Eighth Avenue West to Third Avenue East in September 1882. Small trolley cars or “dinkies” pulled by mules began service on July 6, 1883. The ride cost a nickel. The mules sometimes pulled the cars off the tracks; passengers had to help lift the cars back on track before the trolley could proceed. The company stored its cars and mules in a barn built at Eleventh Avenue West. By 1889 horses had replaced mules as the streetcar engines. Those first small cars had open cabs, so early motormen had to dress for all kinds of weather, even if it meant covering their woolen uniforms with buffalo coats and slickers in the winter. The cars were soon adapted with closures, but that didn’t make the job easier: a motorman was not allowed to sit, speak to patrons, nor smoke cigarettes while operating a dinky. And until 1922, when a token system was introduced, they had to make change for customers. The pay was low, and conductors and those in the machine shops were often expected to work sixteen hours a day. Most employees were immigrants. During the winter, operators had to fight the cold and wet, as slush often clogged machinery. Operators of later electrified streetcars had to also contend with ice forming on wires, which reduced conductivity, and therefore power. Along the way they had to constantly tend to the coal fire of the trollies’ heaters. 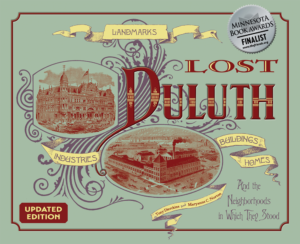 When Duluth regained its city charter in 1887, surrounding townships folded in to create a much larger city. As neighborhoods developed, the streetcar system developed with them. Often streetcar lines were built by land development companies who created the neighborhoods, but their operation would be handled by the Duluth Street Railway Company. In 1890 the dinkies were replaced with electrically powered cars. Overhead wires were strung along the tracks and a power station was built at the Eleventh Avenue West car barn. By 1892 the entire line was electrified, and the railway had increased from four to nearly thirty miles of track. Major arteries included lines along Superior Street, Fourth Street, and Eighth Street. They were extended to Twenty-Second Avenue East, Twenty-Third Avenue West, and later up Woodland Avenue to Hunter’s Park and out to Lester Park. The Highland Park Tramway line, connected to the Incline Railway, served Duluth Heights. Electrical substations sprung up along the lines to provide them with power. Land Companies added stations to their lines, including the Glen Avon station at 2102 Woodland Avenue (it is now a private home). But like so many other businesses in Duluth and throughout the United States, the financial panic of 1893 put great financial strain on the streetcar operation. It had invested heavily during the boom, and now its revenues had suddenly been cut in half. The company reduced operations, leaving new equipment idle. They tried cutting employee wages to stay alive, but that resulted in an employee strike, even though the work force was not organized in a union. The work stoppage resulted in the resignation of manager Fred S. Wardell. In 1898, the company entered receivership.